Gentlemen of Leisure: X-aminations in July 2017...and Beyond! X-aminations in July 2017...and Beyond! The second half of this year finds us diving deeper into 1993, which means we're deeper into Marvel's 30th anniversary celebration of the X-Men/their continued efforts to glut the market with as much product as possible. 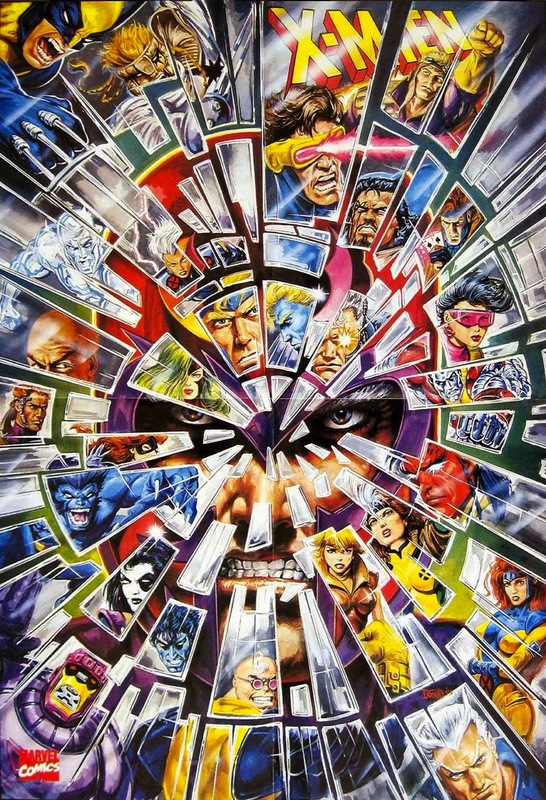 Which means there's not one, but two event crossovers on tap for this chunk of issues: "Fatal Attractions", the official celebration of the X-Men's anniversary, an indirect crossover which finds each series contributing a double-sized issue over a five month period, along with Wolverine & Excalibur finally being brought into the crossover fold and the occurrence of some pretty significant events which will impact the franchise for years to come, and "Bloodties", a shared celebration of the X-Men and Avengers' 30th anniversaries, a relatively "quiet" crossover which only involves two X-books but still features at least one double-sized issue with a gimmick cover. In terms of glutting the market, this batch of issues finds the franchise continuing to expand, in the form of two new regular series (the super-sized quarterly X-Men Unlimited and the theoretically-monthly Cable solo series), forcing me to adopt a three week rotation (at best) of just the "standard" titles (and it's only going to get worse, folks), and solo limited series for Deadpool, Sabretooth and Gambit, on top of the usual extra fare of annuals and superfluous Wolverine one-shots and Marvel Comics Presents stories. At this point in 1993, the comic market bubble is about to burst, but you wouldn't know it from looking (which, of course, is partially why it burst). But despite that and the clear commercial motives behind many of the issues scheduled for review in the next few months, this remains one of my favorite eras of X-history, a time when I was in deep for everything Marvel was doing, including adding Wolverine & Excalibur to my monthly buys for the first time, completely oblivious to the behind-the-scenes financial motivations and eagerly buying what they were selling, literally and figuratively. These issues represent some of my fondness and most specific comic book memories from a time when I still believed everything happening was part of some grand narrative plan, when I waited with baited breath for the next installment of each series. I'm looking forward to revisiting them again, double-sized, holographic, foil-embossed warts and all. Holy nostalgia, Batman, I used to have that poster hanging above my bed as a kid. One of my favorite things from this era was how many X-Men specific licensing stuff also included characters from X-Factor, X-Force, Excalibur, etc. It made the different groups feel more like a family. This was interesting after years of the various teams not interacting or being at odds with one another, to being at a point where you have an issue like X-Men #25 where they recruit Quicksilver to help them confront Magneto. Yeah, I have no idea what happened to mine, I think it was thrown out when we moved a couple years later. Speaking of posters and moving, right next to this I had the GIANT Official Handbook of the Marvel Universe poster from the 80s on my wall, and when we moved it went with us.....And got seriously messed up in the move and my parents threw it out. Marvel has since made reproductions, but my poster, which I actually got when I visited Marvel as a kid (My dad worked in sales and they were a client of his company) would apparently be worth hundreds of dollars now if it was in mint condition. 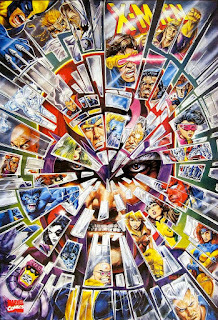 I'm also curious as to what you'll do when you get to the 2000s, where the X-line has what feels like dozens of books (Like multiple X-Force titles at once, multiple Wolverine titles, etc). Here you're getting through about an issue of each book per month, so you're reviewing them at around the same rate they were released. Would you review every book and do what would probably be a 2-month rotation for everything? Or would you skip some books and focus on the core titles? I'm not sure exactly yet how I'm going to handle the Second Big Title Glut of the 00s/10s - my goal, in general, is not to skip any books. But I'm also not sure I really want to commit myself to reviewing every issue of, say, every crappy Wolverine series (or, god forbid, Deadpool) beyond the original one, especially at the cost of slowing the pace of reviews down to (more of) a crawl. 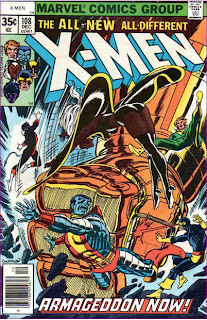 There's also a sense that, as we get deeper into the 21st century, and especially after UNCANNY X-MEN, the final holdout, fell to Marvel's insane "cancel/relaunch/cancel/relaunch x infinity" business model, that the notion of the X-books telling any kind of cohesive narrative, however tenuous, is gone, which deflates some of the purpose of my issues-by-issue, month-by-month approach. All of that said, as we get closer and closer to the present day, the amount of story/content per issue gets less and less, which also means the amount I have to write about per issue decreases as well. By the height of the "write-for-the-trade" approach of the Quesada/Jemas era, for example, one issue of UNCANNY is roughly equivalent to the first fives pages of a Claremont issue, in terms of incident, characterization, etc. Which means it will, theoretically, take me less time to write up an issue, because summarizing the plot will take less time, writing up by analysis will take less time, etc. Which means I could, theoretically, write more reviews per week, either on standalone days or doubling up. So instead of covering three issues a week, maybe we do four, or six. I dunno. We'll see when I get there, but it's definitely something I think about (I could seriously talk about this for hours). For now, I have no concrete plans to stop any time soon, or to radically change my approach. It'll be a few years before we even hit the 2000s, especially with CABLE adding a third week to the rotation (which will soon be joined by GENERATION X, and then X-MAN, if I can bring myself to read that again). I admire your dedication to this project. As Ian said, you're basically covering these things at the rate they came out (or will be soon enough). At this rate you won't even hit the early 00s until somewhere around 2025! Man, I salute you! One benefit of the early 2000s books and onwards is that pretty much every story was told in multiple issues as one arc, which could be more easily digested in trade format. Perhaps instead of single issues you could do it by story arc. Although that would mess up the order of publication slightly. It's crazy to think I've been reading this blog since 2012 when you were around UXM #150, and aside from some random guest appearances it was that one book. It's also crazier to know that the book was semi-cancelled in the 60s due to low sales, when now it's got 100 spin-off titles monthly. It'll make its triumphant return with a review of the less-than-triumphant STAR WARS ANNUAL #2 this Saturday! This is one of my favorite eras too, and I will unabashedly tell that to anyone who asks. My top two X-Men periods are early Claremont to the start of mid Claremont, which you could also just call Claremont/Cockrum/Byrne/Smith (UNCANNY 94 - 175) and Lobdell/Nicieza from "X-Cutioner's Song" through "Onslaught" (though Nicieza left a few months before the latter event). I like a lot of stuff post "Onslaught" as well, but that run, roughly UNCANNY 294 - 338 / X-MEN 14 - 57 is the height of it for me.